Incoming and returning trustees gather outside Russell Museum with Myra Larcombe of Opua, a Lane descendant, Deirdre and John Grant (Commodore of Russell Boating Club and Lindsay Alexander. 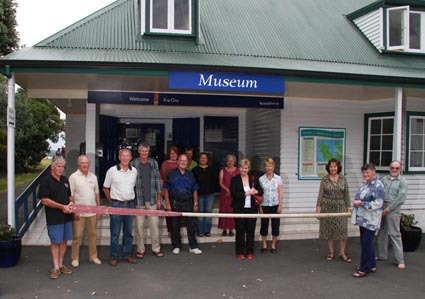 This was a double celebration with Myra, John, Deirdre and Lindsay presenting Russell Museum with an oar, once owned by the Lane family, from the Hinemoa, the sister whaling vessel to the Tutanekai, now housed in the museum whaleboat shelter. This was the first meeting of the last Board elected at the Triennial General Meeting held October 2010. Most of them were re-elected in 2013. The Russell Museum is administered by the Russell Centennial Trust Board. The Russell Centennial Trust Board is a registered Charitable Trust. The Board is elected by the people of Russell every three years at their Triennial Meeting. The elected members of the Board are the Chairperson, a Deputy Chairperson plus six others. The Russell Library Committee and the Far North District Council nominate a representative each and the local Iwi must be represented also.